Why Do You Need to Pierce Potatoes Before You Bake Them? The moment when you are standing in front of a ruined dinner and a mess in your oven may not be the time to ask why you need to pierce potatoes before you bake them. 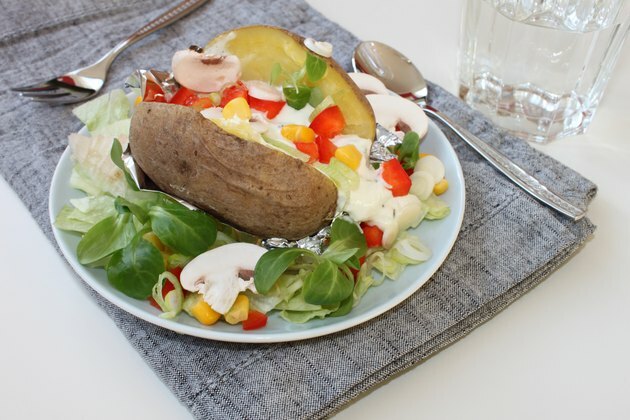 From the time you were a child, you likely saw your parents pierce potatoes with a fork or knife before baking them for your dinner, but didn't know why. The reasons are simple and scientific. A potato has two parts, the flesh and the skin. Though a standard baking potato has white flesh and brown skin, the skin can just as easily be yellow, white, red, purple or blue, and the flesh can be a number of colors, as well. The taut skin, however, always does the job of protecting the more delicate flesh while the potato grows in the ground and during travel before it reaches your home. Once introduced to a heat source, the same skin that protected the flesh now traps steam inside the potato. When you put a potato in a microwave, the small oven cooks it by depositing energy into the potato's water molecules. A traditional oven does the same thing but deposits heat. When the food cooks for a long time, as a hard potato must to become soft, the water inside can reach to a boiling point. When the food has a hard outer shell with no place for the boiling water's steam to escape, it explodes, according to the University of Virginia. After thoroughly scrubbing your potato, take a fork or sharp knife and make at least two deep incisions in each side of the potato. This will create holes for the steam to escape and help you to create delicious baked potatoes, as well as protect your oven from a mess. If you forget to pierce holes in a baking potato, it will explode and you will have a mess in your oven. To clean this, The University of Florida recommends removing the cooled racks from your oven to the sink and hand-washing them with warm water and steel wool. After the oven has cooled, scrape off what you can by hand and soak the remaining spots with an ammonia-moistened rag. Leave the spots for 30 minutes, then remove with a water-soaked rag. Rinse oven walls several times before using the oven again.